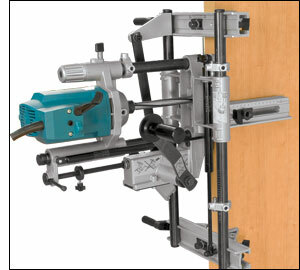 Specially designed for quick, precise mortising on doors or other elements, either on site or in the workshop. The fixing system allows the mortising of doors that have already been hung, without damaging the surface. Its quick measurement adjustment permits multiple mortises to be made quickly. Possibility to trim the frontal lock plate just by changing bit. Also able to work horizontally. For mortising grooved doors or those with overlap, there is an adjustment system to centre the machine. Optional bits are low cost and easily interchangeable, as they use the same tool-holding shaft.